H2652 Britton Smith and 5576 Leonard Lee are two names that are well known through a few generations of Ex Cadets. On Saturday afternoon of Reunion Weekend they became numbers 28 & 29 to make it to the Wall of Honour. The Class of 1963, as their gift to the College upon entry into the Old Brigade in 2009, have created and donated to RMC, a Wall of Honour to recognize ex-cadets of the Royal Military Colleges (RMC, Royal Roads Military College, RMC Saint Jean) and others with College numbers for outstanding achievements and contributions to Canada or the world. 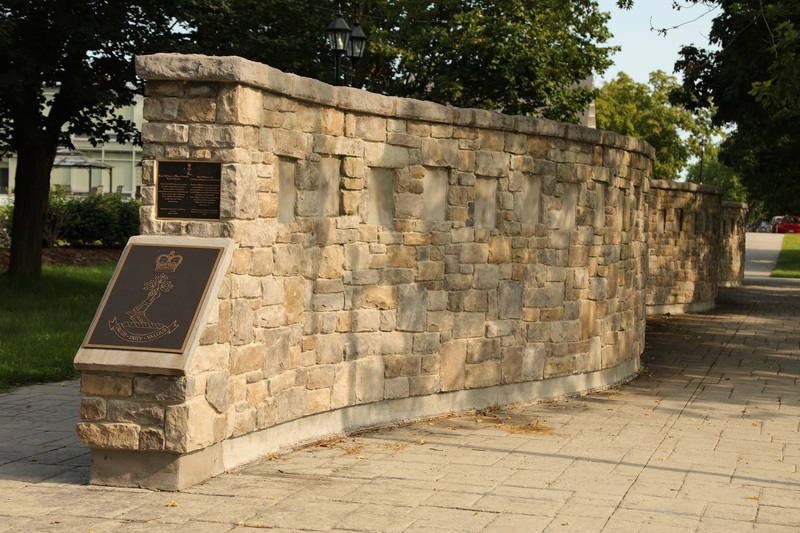 It is intended that those recognized on the Wall of Honour inspire prospective recruits, existing RMC students, RMC graduates, RMC staff and all Canadians to be the best they can be through dedication, hard work, application of their talents and training and by letting the College’s motto, “Truth, Duty, Valour,” guide their lives. It was nice to see such a large crowd in attendance, in particular, the large contingent of cadets. 18777 BGen Sébastien Bouchard, RMC commandant spoke briefly on what the WoH means to the college. The family of Len Lee was well represented: Family members included Len’s widow, Lorraine, their two sons, Robin and James, their wives, Lucie and Jacquie, grandchildren, Annick and Philippe, and Phillipe’s wife, Isabelle. Many of Len’s Class of ’62, were on hand and by coincidence it is their 55th reunion. Classmate 5604 Ken Smee had the special honour of unveiling Len’s plaque. Members of the Princess of Wales regiment, members of the RCHA and fellow gunners of Britt were spotted in the crowd. Britt Smith had the audience rotating from tears,to laughter, to awe. He took on the task of speaking on behalf of the two inductees. The 97 year old former practising lawyer (QC) had the attention of EVERYONE while he spoke. His talk was captured on video and we will be attempting to find the link once it is Online. If the intention of the Class of 1963 that those recognized on the Wall of Honour inspire everyone who walks past to be the best they can be than a BIG step was accomplished in that direction this past weekend. If you’re not sure ask anyone especially the cadets who were there. BZ for those involved for pulling off such a classy event.